"Being part of behind-the-scene activities provided a sense of accomplishment." This statement by one of our dedicated drivers reflects the sentiment from our staff members after a disaster response, regardless of closely we were involved with deliveries. Knowing that we could help, especially in an emergency, makes everything worthwhile. When a Native American community is hit by a natural disaster — such as a fire, tornado, flood or, blizzard — it is reassuring that we have services and systems in place to assist in these emergencies. For example, a week following the fires on the Fort Apache Reservation, our Phoenix office received a call to seek assistance from our Emergency service. After the conversation, it was determined that there were items that would assist the community in their continued response efforts, working through our Navajo Relief Fund program. 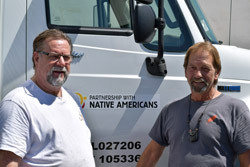 After the first shipment to Whiteriver, Arizona, we sat down with one of the drivers who made the delivery. Like most days, it was an early day in the warehouse. Things functioned best when the morning hours were utilized to take advantage of the cooler temperatures. The Phoenix heat can make warehouse work more challenging, so 5 AM was a good time to get going. After a few hours, the truck turned off to enter the Cedar Creek community that leads into Whiteriver where the command center was located. 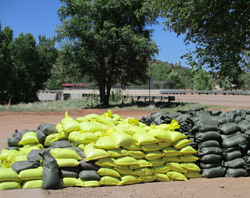 There were trucks filled with sand and piles of sandbags. When they arrived at the command center, the staff explained to the drivers the reason for the sand. From their experience, when they had a fire, it created a shell over the earth because of the intense heat over the soil. Then when the rains came, it just rolled right down; the bags were to be used to divert the water away from homes. There were obvious signs of the fire and its impact on the community. Flooding rendered families in a fire community more vulnerable and the monsoon season was upon them. The area had already experienced some rainfall, and even hail, so they were bracing for the effects that would come from the precipitation. There were obvious signs of the fire and its impact on the community. Even the food source was impacted. There were many more warnings posted advising drivers to pay attention to the animals that have been forced from the fire areas into more populated areas. The staff in the community was grateful for the items on the first shipment and the driver assured them that they would be back with more supplies. The driver expressed a sense of duty and contribution different than his regular deliveries. His perception was that the planning in the community was supported by a team which communicated with one another and made the proper decisions. He expounded, “They were busy. There were people directing us and even without the infrastructure we have in cities, they were making it work.” It was clear there was a real need and the intent was to do the best they could for the community. There would be two more deliveries to the area before we were done. The communities were thankful for the assistance and we were grateful for generous supporters who helped ensure essential supplies could be provided after such a stressful disaster.